If you do not already have an account, create a free account. We recommend first setting your Time Zone. From the Accounts page, select Profile and make the adjustment there. On the Accounts page, click Add New Source (). Select the Type you wish to read from the drop-down menu. Remember that FitnessSyncer will only read this type of data from this location for this source. 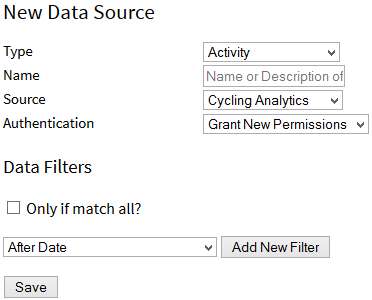 Select the Source for the data from the list. Depending on the source, you may need to enter your username and password for that service here, or you may be redirected to the device or service’s website after saving the item to grant FitnessSyncer access to your information. Click the Save button. All other properties are not required but you can learn more about them in Sources. You can now click the Sync () button to pull in your data. Depending on how much data you have, this may take some time. You may wish to refer to any specific documentation for the service you are synchronizing for any specific information for them. Once it is available, navigate to our Dashboard or Stream to see your data. If you do not have any accounts at any our supported sites, you can always use our Notebook to keep track of your information or use the FitnessSyncer Uploader to upload your content into FitnessSyncer. This is also a great way to get started with FitnessSyncer. For more information, please see the Notebook section. 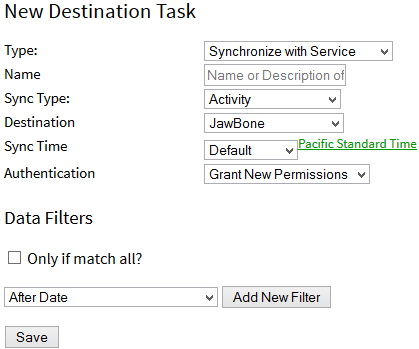 On the Accounts page, click Add New Destination Task (). Select the Destination you wish to synchronize with. Depending on the destination, you may need to enter your username and password for that service here, or you may be redirected to the device or service’s website after saving the item to grant FitnessSyncer access to your information. Click the Save button. All other properties are not required but you can learn more about them in Sync Destinations. To try your first sync, click the Sync () button near your Destination Task on the Accounts page. Depending on how much data you have, this can take a long time.